Request full data and installation information. High quality stainless steel solenoid valves from a leading European manufacturer. Our direct acting stainless steel valves from ACL are available with port sizes from 1/8" to 1/2" BSP. These proven all-metal poppet valves can operate over a pressure range from zero up to the valves maximum differential pressure (up to 100 bar depending on type). Our direct acting valves feature a compact physical size and offer fast response times of typically 8-25ms for air and 12-40ms for liquids depending on viscosity and on valve type. Optional features include: silver shading ring, explosion proof coils and versions for use with oxygen. Servo-assisted stainless steel solenoid valves offer the benefits of significantly lower cost and power consumption when compared with direct acting valves and are able to offer the same performance in terms of flow rate and maximum operating pressure. Because they require a minimum pressure to open the diaphragm servo-assisted valves are not suitable for zero pressure applications. 3-way normally open valves are usually stocked in 1/8â€ and 1/4â€ sizes with Buna (NBR) seals but other materials are available to order. 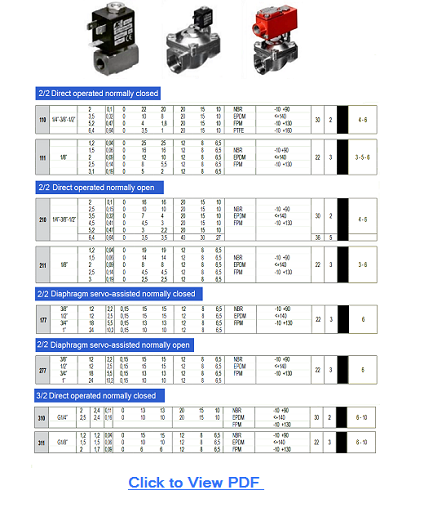 Like other direct acting solenoid valves the operation of the valve depends only on the forces produced by the solenoid coil's magnetic field and the return spring acting on the valve's armature, allowing these valves to operate with zero pressure. Beta Valve can also supply stainless steel solenoid valves that meet the requirements of the ATEX directive for use in hazardous environments. Available in sizes 3/8" to 1" and offered in all standard voltages. With over 30 year's experience in the supply of solenoid valves and other fluid control products Beta Valve Systems can supply products from some of Europe's leading component manufacturers to meet your requirements in the areas solenoid valves, water meters, water filtration and pipe fittings. Since 1991 we have produced our own range of solenoid valves which have been used in applications such as drinks vending industry, gas analysers, floor washers and hydroponics. We place our customers at the centre of everything we do and strive to provide the highest quality products and service. We offer full technical support, from providing product datasheets straight from our website, to expert technical advice by email, phone or personal visit. Close ties with the manufacturers gives us direct access to our suppliers technical staff too. To support your development or production requirements we can ship most ex-stock orders the same day from our extensive UK stocks. We also provide logistical support by holding buffer stock against call-offs and scheduled orders.